In small bowl, mix melted butter and honey; set aside. Coarsely crush cereal. In medium bowl, mix cereal, 1/2 cup salted peanuts and 1/4 cup miniature chocolate chips. Add butter mixture; stir to thoroughly coat. Press mixture firmly in bottom of pan. Bake 10 minutes; remove to cooling rack 15 minutes. Place in freezer about 10 minutes or until chilled. Meanwhile, in small microwavable bowl, mix 1/4 cup peanut butter and 1/4 cup miniature chocolate chips. Microwave uncovered on High 30 to 45 seconds, stirring every 15 seconds, until smooth. Set aside to cool. Remove crust from freezer. Spoon yogurt over crust; spread evenly. Spoon peanut butter mixture in small dollops over yogurt. Using knife, swirl peanut butter mixture into yogurt. Sprinkle with Toppings. Freeze completely, about 4 hours. Remove from freezer 10 minutes before cutting. To make cutting easier, line pan with foil, leaving edges hanging over sides of pan, and then spray foil with cooking spray. Make as directed. When frozen, simply lift dessert out of pan by foil edges, and place on cutting board to cut. 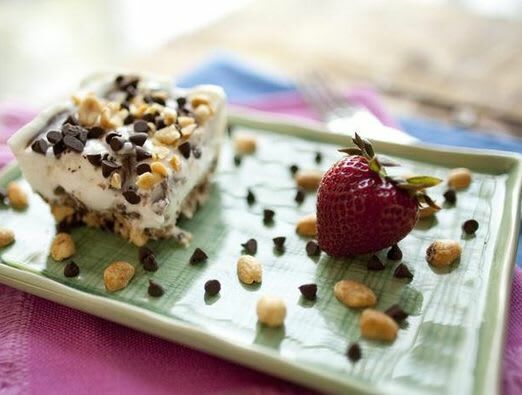 This frozen dessert can be stored tightly covered in the freezer up to 2 weeks.